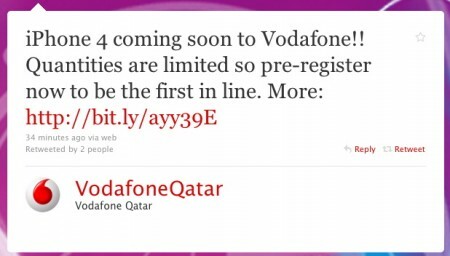 Vodafone Qatar followed their Egyptian counterpart and announced that the iPhone 4 will be available soon. Vodafone Qatar did not announce the pricing and the actual launch date however. My personal guess is 24th or 25th because that pre-order “promotion” is going to end on the 23rd. Make sure to register on Vodafone Qatar’s iPhone 4 page: Be first in line for iPhone 4 â€“ Pre-register now | Vodafone Qatar.